When Kevin & I moved in to our current house, the owner really had no interest in renting out the property. You may know from previous posts, our home is smack dab in the middle of 130 acres of blueberries; this was the owners only real focus, and collecting rent on the house was a non-issue (must be nice;)). So the grass in the 2 acres surrounding the house was about – oohhhh – 6 feet high lol. It had become overrun with mice and frogs and was in a state of semi-disrepair (if you’ve seen the pictures of our pool full of frogs, you’ll have a good idea of how the house looked when we got there). He had planned on bulldozing it until we came along. Understandably, the owner decided then and there to never allow pets again. Kevin and I are not afraid of some hard work. We spent a good amount of time and energy cleaning everything, putting in vegetable and flower gardens, and making the house beautiful again. 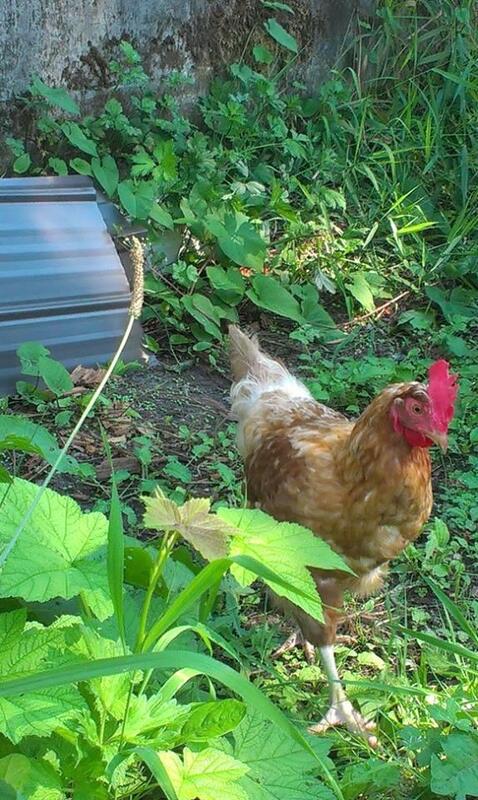 In our previous home, we’d kept chickens for years, and we had intentions of raising them again in the future. We both miss not only the farm fresh eggs (which will turn you off store bought eggs forever), but the hilarious personalities that you meet when you keep hens. The owner does not want us leaving, and we told him we need chickens. LOL. For the longest time in the beginning, we had only one chicken. We got her a few friends before winter set in, and Chicken ran the roost. For those of you who know your chickens, we had Rhode Island Reds, as well as an Americauna/Mohawk mix with blue/black feathers who laid the prettiest blue eggs. However, I was not so attached that I couldn’t continue cooking her nameless distant cousins…. 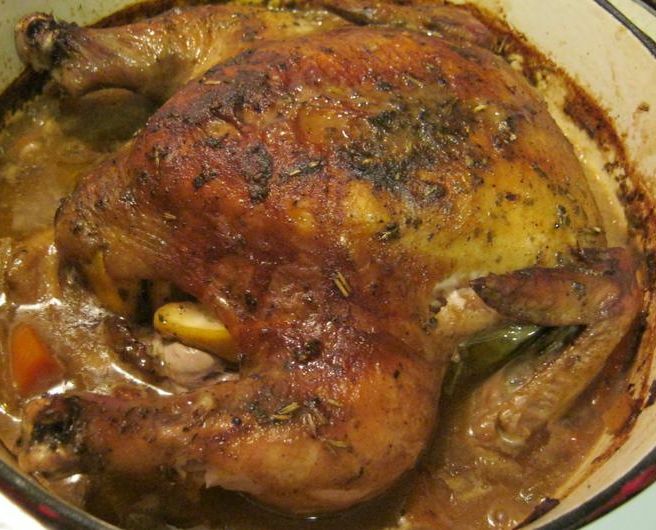 This recipe is based on my earlier post Roasted Whole Chicken. 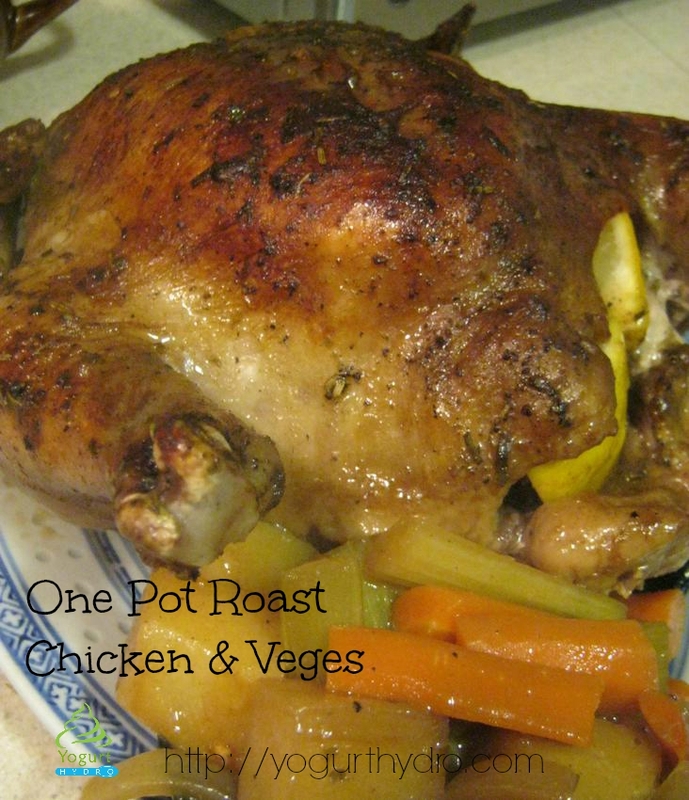 I love the lemon and garlic flavor with chicken, and I also love one pot no-fuss dinners! I used the same recipe, but I chopped up 2 large russet potatoes as well. I also added extra spices (based on what was in the cupboard!) and more soy sauce and water. I sprinkled 3 handfuls of flour over the top, and mixed it all up. Remember, the more you add to the pot, the longer it will take to cook thoroughly. This time, I wanted everything – and I mean everything – in one pot, right down to the gravy. A few of you mentioned you’d never made gravy before…THIS is about the simplest method ever. After all the food, flavorings, and water are in the pot just throw a couple handfuls of flour into the mix. Add chicken and cook. Easy-peasy and delicious! I can hardly wait to raise chickens again! Do you keep chickens? Our family keeps chickens. For eggs and for meat. To be honest I don’t really like those animals. I find they can be a bit dumb and dirty, but raising your own chicken and eggs is something I am glad our family is able to do. We know what they eat and drink so therefore we know what we are consuming. You can’t really say that about what you buy in the store. It makes me feel better knowing I am getting the best for me and my family. I tried posting this yesterday but it didn’t go through so I’m trying again. Our family keeps chickens. For eggs and for meat. To be honest I don’t really like those animals. I find they can be a bit dumb and dirty, but raising your own chicken and eggs is something I am glad our family is able to do. We know what they eat and drink so therefore we know what we are consuming. You can’t really say that about what you buy in the store. It makes me feel better knowing I am getting the best for me and my family.